﻿ Sevilla 2-1 Real Madrid. From heaven to hell in just 3 days! 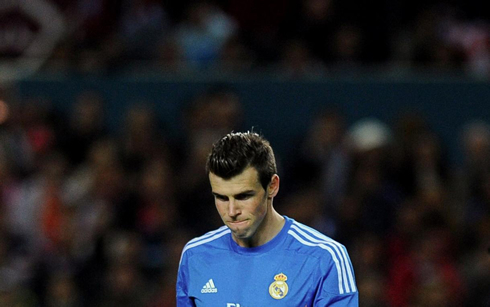 26.03.2014 » Sevilla 2-1 Real Madrid. From heaven to hell in just 3 days! Real Madrid slipped for the second consecutive time in La Liga, this time in their visit to the Sánchez-Pijzuán in order to face Sevilla. The hosts came out on top with a 2-1 win, which has made Real Madrid drop into 3rd place, now 2 points behind Barcelona and 3 points adrift of the surprising league leaders, Atletico Madrid. 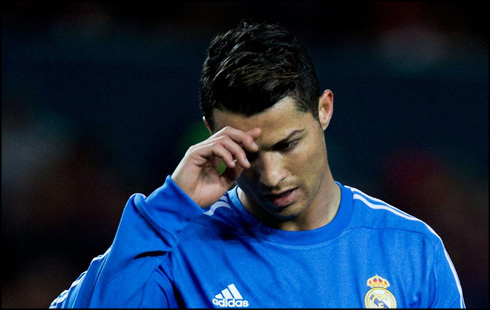 Cristiano Ronaldo scored the Merengues' lone goal, which soon proved to be insufficient to bring any points at all home. In such a tight race for the title as we got this season in the Spanish League, mistakes like the ones Real Madrid made this Wednesday night against Sevilla can very well end up wiping them of the title race. Sevilla showcased their excellent form and managed to beat Real Madrid by 2-1, extending their winning streak in La Liga to 6 games now. As for Carlo Ancelotti's men, they've lost their second straight game in Spain and despite their defensive solidity thus far in the season, they have now conceded 6 goals in the last 2 games (4 against Barcelona and another 2 against Sevilla). Cristiano Ronaldo still found a way to put his name on the score sheet through a free-kick, but Carlos Bacca's brace would complete the hosts' remontada further in the game. How things can change from one week to another! Just a few days ago, Real Madrid were on a 31-game unbeaten streak, ready to host Barça at the Bernabéu and with a sublime chance to put them out of the title race, had they won the Clasico. Things didn't turn out to unfold the way the Merengues expected and after losing against Barcelona last Sunday and now against Sevilla this Wednesday, Real Madrid dropped the league's leadership and saw both Atletico and Barça taking off in the standings. After last weekend's Clasico, Angel Di María and Sergio Ramos got suspended and were therefore unable to give their contribution to the Merengues in their trip to Sevilla. This seems to have raised a few doubts in Carlo Ancelotti's mind straight away... While replacing Ramos for Varane in the centre of the defense was only logical probably in everyone's view, sending in Asier Illarramendi to take Angel Di María spot in the starting eleven proved to be a disastrous choice. The Argentinian has been one of the main responsibles for delivering a great dynamism into Real Madrid's midfield this season, and seeing Illarramendi trying to fill the Argentinian's shoes was quite simply a very contrasting evidence of the difference between these two players. Playing Xabi and Illarra at the same time immediately uncovers a huge lack of creativity in Real Madrid's attacking midfield, which Luka Modric all by himself can't simply deal with. Nevertheless, it would be Real Madrid breaking the deadlock in the first half, after a Cristiano Ronaldo free-kick a few meters outside the box. The Portuguese forward saw his shot being deflected on Carlos Bacca's arm which caused the ball to immediately switch its direction into the opposite side of the goal. Sevilla's goalkeeper Beto, limited himself to stare at the ball as he waved his arms helpless and was already beaten. 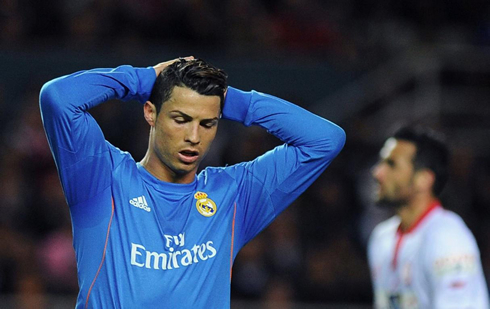 That was Ronaldo's 4th free-kick goal this season, who now has 27 in La Liga. 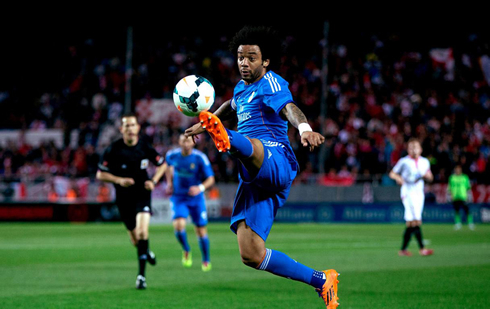 Real Madrid had got off to the better start, but the hosts were about to come into the game with great determination. After Ronaldo's opener in the 15th minute of the first half, it took only 4 minutes for Sevilla to send things back to square one and level the match at the Sánchez-Pizjuán. The former Arsenal winger José Antonio Reyes, chested down a ball near the sideline on the right as he controlled a long pass and delivered it straight away to Carlos Bacca, who had just been running forward to escape both Illarramendi and Carvajal's marking. Sevilla had just caught Real Madrid off guard in a fast counter-attack and the Colombia international finished it off with a great technique gesture, as he beat Diego López by striking the ball with the outside part of his boot. Despite everything that went wrong last night, we can't really say that Real Madrid didn't react well to that visitors' goal setback. The Merengues managed to collect a handful of good goalscoring chances in the remaining minutes of the first half, but for one reason or another, the ball didn't go in. The most clear cut chance created came off a nice initiative from Illarramendi, who managed to send the ball over Sevilla's defensive line in order to put Ronaldo face to face with Sevilla's goalkeeper. The Portugal international somehow got to reach the pass before the visitor's goalie, but only had time and space to stretch his leg and attempt to lob the ball over his opponent's body. Unfortunately, his touch hit the post and even bounced a few times near the goal line, just before someone else got there and cleared it away for good. According to Marca, this was the 13th time Cristiano Ronaldo hit the woodwork this season and the 46th since he plays for Real Madrid. As the game marched to its end, Sevilla reached the winning goal in what has to be acknowledged as a superb play from the hosts' captain, Ivan Rakitic. The Croatia international showcased his immense talent on a terrific piece of skill, that basically left Pepe behind him chasing his own shadow. The dribble can be described as an oriented backheel control, that brilliantly made the ball pass over the Real Madrid defender. He would then move forward on the field for a few more seconds without any serious opposition in front, just before he laid a delicate pass to Bacca. The Colombian striker was therefore given a chance to beat Diego López for the second time on the night, this time by sending his strike right between the Real Madrid goalkeeper's legs. 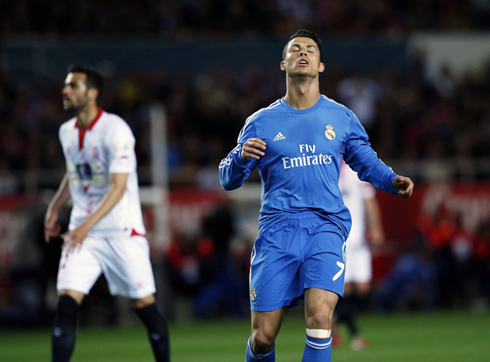 Cristiano Ronaldo next game for Real Madrid will be against Rayo Vallecano, on March 29 of 2014. You can watch Juventus live stream, Real Madrid vs Rayo Vallecano, Espanyol vs Barcelona, Manchester United vs Aston Villa, Arsenal vs Manchester City and Southampton vs Chelsea, all games provided from our sports live stream pages.